Today would have been your 2nd birthday. 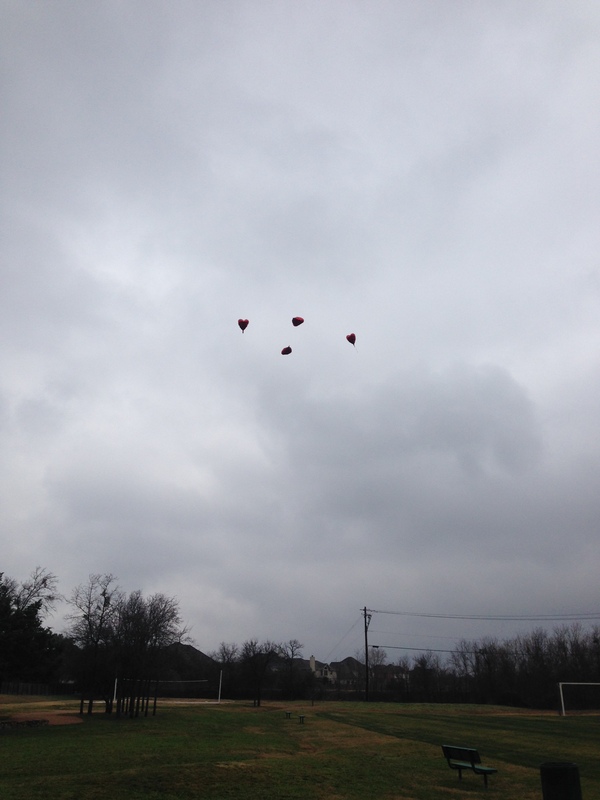 We planned to release red, heart-shaped balloons, since you are our Valentine baby, and to eat cupcakes. During the last week or so, I was pleasantly surprised to find myself looking forward to celebrating your birthday. It seemed like it would be fun. The actual celebrating part was definitely meaningful. Otherwise, this day and its accompanying emotions hit me like a ton of bricks. Doesn’t it seem silly that I would be surprised at feeling sad on your birthday without you? But I was. I certainly expected to feel sad, but the amount of it, the weight I felt on my entire body from the moment I woke up, was surprising. I think this day ties with Halloween for the hardest special occasion since you died. I just so enjoyed having you and dressing you up and celebrating with you on both of those occasions and it is terribly hard to have them without you. First of all, I noticed that I just could not make myself get out of bed. It’s been getting harder the past few days, because I have not been sleeping well, so I tried to attribute it to that. But it was singularly difficult this morning. Once I was up, it wasn’t any better. I felt exhausted and annoyed by everything. I just wanted to bury my head in my phone and not deal with anyone. I tried so hard to be my usual self for your brother, but I had to give myself some leeway. I did my best to explain to him that I was feeling sad, I might have more trouble than usual being patient, but that it would not be his fault or because of anything he did. It actually seemed like Max understood. He was pretty sensitive for a four-year-old today. He kept saying, “Don’t worry, the new baby is on its way.” He used to say, “You still have me” when I was sad. He really is the sweetest little man. I limped through the morning. I texted Daddy and he offered to bring home lunch and help with Max for a little bit, so I could rest. Not too long before he got home, I posted about your birthday on Facebook. I shared pictures from your birthday morning last year. Posting the words, “We love and miss you” finally did it. The dam broke. I cried and cried and I didn’t want to stop. It felt so good. That oppressive, awful heaviness that had weighed me down all morning started to lift. I prayed to feel some kind of connection with you today. I wanted more than anything some kind of sign that you are still out there and you’re okay and I will see you again one day. I’m not sure if this was it, but a good friend and I cleared up a misunderstanding today. We both thought you might have had a hand in it. The afternoon and evening went all right. Max and I ran some errands, mostly connected to your birthday. 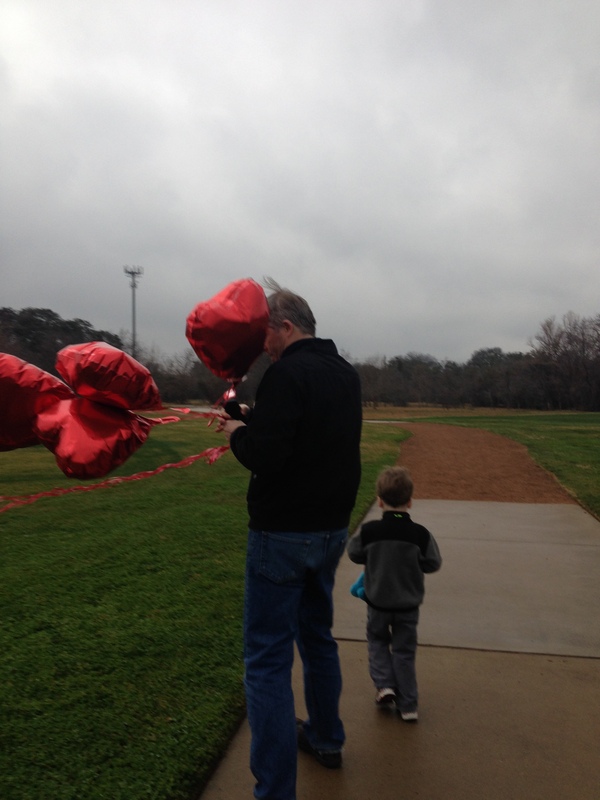 Daddy came home early and we released red heart balloons in the park. One of them stuck in a tree twice, just like when our Kingwood relatives released balloons for you last weekend. I think that was a sign from you, too. After dinner at Jardin Corona, we ate pink and white Valentine cupcakes in your honor. We even sang “Happy Birthday” and blew out candles. Max seemed like he did pretty well today. He cried one time out of nowhere and I think that might have been connected to you. 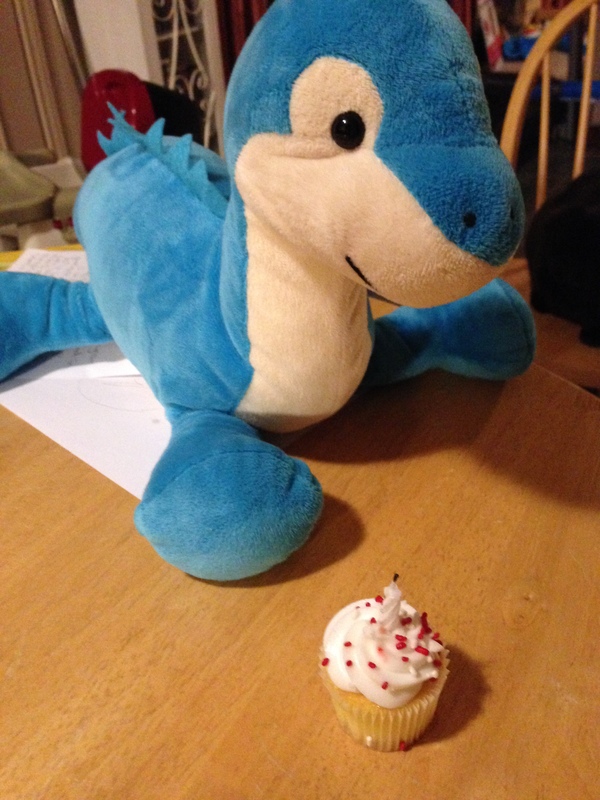 He also found your stuffed diplodocus in your room and took it to dinner with us. He carried Dippy when we released balloons for you and made sure she sat with us during dinner and dessert. We looked through the “Max and Lucy Memory Book” this morning. He laughed when we shared Lucy memories during dessert. I miss you so much, baby girl. 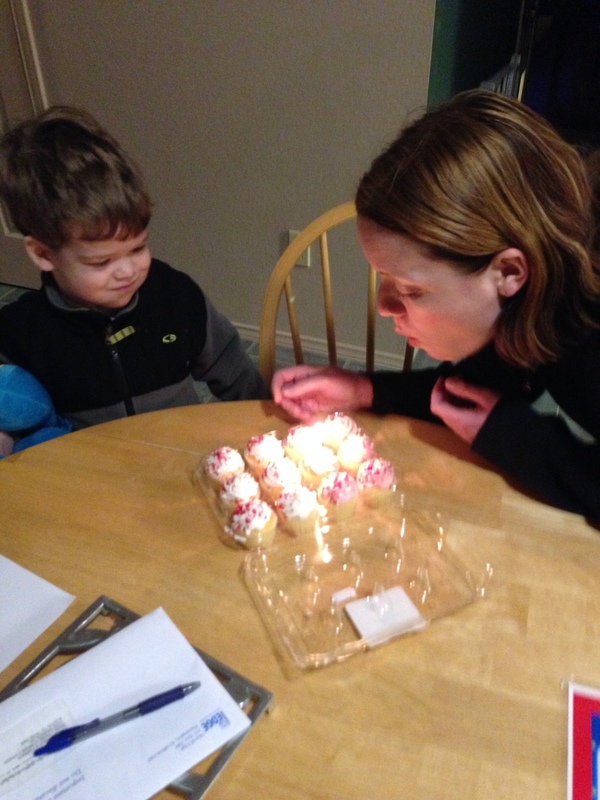 It is just wrong to miss your child on her 2nd birthday. I cried off and on the whole day, but it felt good to do that. It felt right. I’m crying because I miss you and I miss you because I love you. Feeling that so intensely is the best gift this day could have given me, besides having you here. Two years ago at this time, I was finishing my first day with you. A year ago at this time, I was wondering how many years I would get with you. I didn’t know it was a matter of months at that point. I wish you were here. Not only that, I wish you could be here and I would somehow know about this alternate timeline. I want to have you here and be able to feel the way I would feel if you suddenly appeared in front of me right now, whole and well and two-years-old. If I could go back two years and do those 15 months all over again, I would. I would take all of it, the good and the bad. Hopefully, I would know what was coming and maybe be able to do something to change it. If you appeared in front of me now and I was told I could have 15 months with you, I would be overjoyed. Fifteen months would feel like an embarrassment of riches right now. Happy Birthday, my lady baby.